©Bert Gildart: Some of you who are hard-core country and western music buffs may remember a song about a plant that grows down South called Poke salad. The plant was made popular by Tony Joe White who created a ballad about the species. White sang the song on the Johnny Cash show, which ran during the early 1970s. 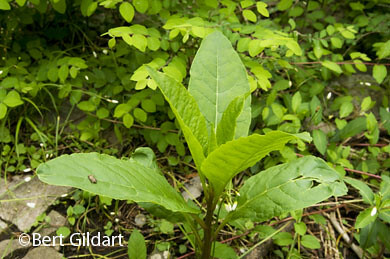 Poke Salad made from this plant, which grows in the hills and swamps of Alabama, Mississippi and Louisiana. Recently, a DVD was released popularizing the show and Janie bought me the album for Christmas this past year. One of the episodes featured Tony Joe White, and though we’ve been playing it often while traveling in our Airstream along the Natchez Trace it seemed particularly appropriate to play it when we settled for several nights at the farm owned by my college roommate, Ed Anderson, featured in a blog posted April 17. Ed and family live just off the Trace. During our stay, we discussed the Johnny Cash show, and then we honed in on some of the songs we could relate to specifically. One of them was Poke Salad Annie. From that we decided to make an evening out of Southern foods–and because Ed and his family are always poking fun about the ways some folks view their country ways, we decided to do it up right, gathering as much from the woods and fields as we could. 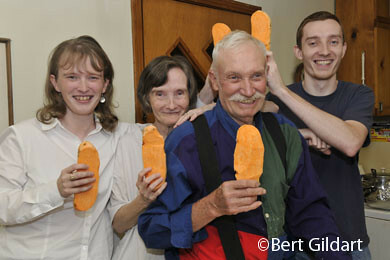 Poking fun at their thorough enjoyment of Southern foods, in this case, their love of sweet potatoes. 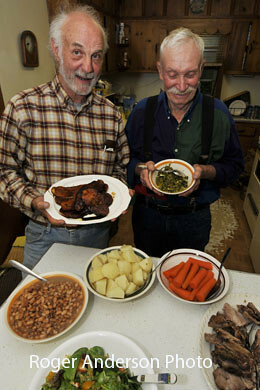 “We’ll make this an evening of real Southern cooking,” laughed Ed, Sarah and his two children, Anna and Roger. Well, that sure pleased me, as some of my fondest memories are of Ed and me hunting years ago on his father’s old farm–scurrying behind a pack of beagle hounds; then chowing down on some of the foods fresh from the farm. It also pleased Janie, who believes the Andersons are one of the nicest and most genuine families she’s ever met. Next we gathered sweet potatoes from his stash, some paw-paws for bread, and black eyed peas. I chopped up the sweet potatoes, and then like the days when we boarded at Pope’s Tavern, I added brown sugar and then cooked them up. About all that was missing was a glass of butter milk and a little corn bread to stir into the milk. Ed's love of southern menus and country ways may be equalled by mine. And, now, if you want to know what you’re missing, here’s the refrain and first part of Tony Joe White’s hit song. Everybody calls it Poke salad. Poke salad. The song first sung by White and later by Elvis Presley, continues, and you can hear the entire version if you order the Johnny Cash show from Amazon. 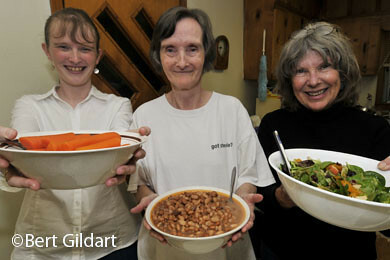 Janie (R) joins Anna and Sarah (and me) in touting traditional Southern cuisine. In the meantime, enjoy our food photos and if you want to try some of these delicious menus, our secret receipts are available. But they ain’t cheap. This entry was posted on Wednesday, April 22nd, 2009 at 9:38 am and is filed under Photography, RV Travel, Travel. You can follow any responses to this entry through the RSS 2.0 feed. You can leave a response, or trackback from your own site.